As part of PG&E’s environmental commitment, we have had a robust program of environmental remediation for more than 20 years with the goal of cleaning up contamination associated with historic company operations and the operations of predecessor companies dating as far back as the mid- to late-1800s. In 2010, PG&E continued its efforts to fully remediate these sites by addressing more than 150 environmental remediation projects, including divested power plants, PG&E operating facilities, former manufactured gas plants and gas compressor stations. We achieved several important milestones with our environmental remediation projects in 2010, including final approval from the California Department of Toxic Substances Control (DTSC) of our workplan to remediate the property at our former Hunters Point Power Plant in southeast San Francisco. Keeping our promise to the community there, PG&E closed the aging facility in 2006 and completed its subsequent aboveground demolition in 2008. The cleanup of the property began in 2010 and is currently under way under close oversight of multiple regulatory agencies. With the partnership of a community-based project advisory committee, we are working diligently to keep the local community updated on activities on site and continue to employ local labor, consistent with our corporate environmental justice policy. The project is making use of locally owned rail transportation, allowing for both local economic development and fewer truck trips through the community. We have also made a significant effort to work with the community, the DTSC and the Bay Area Air Quality Management District to design an effective program for air monitoring and dust control. We report the results of this effort frequently both to project advisory committee members for dissemination to the larger community and via a project website and the websites of multiple regulatory agencies. We continue to make significant progress in addressing former PG&E or PG&E predecessor company-owned manufactured gas plant (MGP) sites. In the mid-1800s and early 1900s, before natural gas was available as an energy source, thousands of MGPs were commonly located in cities and towns across the country, using coal and oil to produce gas for lighting, heating and cooking. With the arrival of natural gas in the 1930s, most of the MGP sites in PG&E’s service area were closed and the properties put to other uses. Of the 41 MGP sites owned or operated by PG&E in the early- to mid-1900s, 33 have been or are in the process of being remediated. In 2010, we initiated a voluntary program to fully understand the eight remaining sites. These include sites throughout our service area in towns such as Napa, Oroville, Woodland, Fresno and three sites in San Francisco, including two in San Francisco’s Marina district. By the end of 2010, all but one of the 41 sites was in some phase of the remediation process under the regulatory oversight of the DTSC. Review descriptions of the former MGP sites. PG&E’s natural gas system includes more than 40,000 miles of distribution pipelines and approximately 6,000 miles of transmission pipelines, working together to provide service to approximately 4.3 million customers from Bakersfield to the Oregon border. Essential to the system are eight gas compressor stations, which receive, store and move natural gas through the company’s pipelines. Under the direction of state and federal regulatory agencies and with input from numerous stakeholders, PG&E is working to investigate, clean up and restore the environment at both the Topock and Hinkley compressor station facilities. PG&E’s Topock Compressor Station is located in San Bernardino County about a half mile from the Colorado River. Consistent with industry practice at the time, hexavalent chromium was used at Topock in the cooling towers in the 1950s and 1960s to prevent corrosion. From 1951 to 1964, cooling tower wastewater containing hexavalent chromium was discharged into a nearby dry wash, or ravine, where it infiltrated into the underlying groundwater aquifer. PG&E is working cooperatively with state and federal regulators and other interested parties to assess the extent of contamination and clean up the groundwater. Ongoing monitoring programs continue to show no presence of hexavalent chromium in the Colorado River, a source of drinking water. In early 2004, in response to detections of chromium near the Colorado River, state regulators required PG&E to construct and operate a protective “interim measure” to hydraulically control the affected groundwater so it cannot move toward the Colorado River. Initially, this interim measure consisted of wells to extract groundwater near the Colorado River, which was transported off-site for disposal. In July 2005, PG&E expanded the interim measure to include a groundwater treatment plant, which cleans the extracted groundwater so it can be returned to the local groundwater aquifer. Over the past seven years, the interim measures have extracted more than 400 million gallons of contaminated groundwater and removed approximately 6,500 pounds of chromium from the environment. The final remedy for groundwater cleanup was approved by state and federal regulators in January 2011. As outlined in the regulations, the approval process consisted of several steps in which a range of alternative cleanup approaches was evaluated, and PG&E proposed a preferred remedy based on that evaluation. Pursuant to the California Environmental Quality Act (CEQA), the state then prepared an Environmental Impact Report. State and federal agencies jointly sought public input throughout the remedy selection process, including holding public meetings and a formal comment period on the Draft Environmental Impact Report. The approved remedy consists of in-situ treatment of the hexavalent chromium, a technique that has been proven at a number of other sites, and reduces consumptive water use, energy use and the project’s footprint on the desert landscape. PG&E also continued to work with agencies and interested parties to address soil contamination within and around the compressor station. 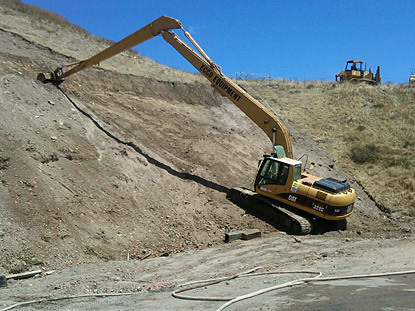 In 2010, PG&E cleaned a ravine disposal site adjacent to the compressor station by removing almost 12,000 cubic yards of debris and contaminated soil. The removed material was transported off-site to a secure disposal facility. Further characterization of less studied portions of the soil and groundwater are being planned. We also continue to work closely with the local Indian Tribes to ensure that they have the ability to meaningfully participate in the remedy-development process, consistent with PG&E’s environmental justice policy. We have entered into written agreements with three local tribes—the Fort Mojave Indian Tribe, the Colorado River Indian Tribes and the Hualapai Tribe—that provide for reimbursement of certain costs incurred by the Tribes in connection with the Topock cleanup. In addition, through the Topock Leadership Partnership, PG&E meets periodically with leaders from state and federal agencies, Tribes and other stakeholders to discuss the project and seek input on its future direction. Finally, PG&E continues to work with the Fort Mojave Tribe regarding concerns it has raised with the nature and extent of mitigation required by the final Environmental Impact Report. PG&E’s Hinkley Compressor Station is located in San Bernardino County, southeast of the city of Barstow. Consistent with industry practice at the time, hexavalent chromium was used at Hinkley in the cooling towers in the 1950s and 1960s to prevent corrosion. From 1952 to 1964, cooling tower wastewater containing hexavalent chromium was discharged into unlined ponds, where it infiltrated into the underlying groundwater. PG&E is working cooperatively at the direction of the California Regional Water Quality Control Board—Lahontan Region (Water Board) to assess the extent of contamination and clean up the groundwater. On August 30, 2010, PG&E submitted a Feasibility Study to the Water Board that evaluated potential remedies to achieve full cleanup of the groundwater contamination at Hinkley. Since then, PG&E has submitted two addendums to the Feasibility Study, further refining the remedy descriptions and analysis. The Water Board has requested a further revision of the Feasibility Study to incorporate the comments of peer reviewers at the DTSC and the U.S. Environmental Protection Agency. Upon completion of the Feasibility Study, the Water Board will prepare a draft Environmental Impact Report that describes the impacts that may result from implementing the proposed remedy, and that recommends measures to mitigate a number of those impacts. The Environmental Impact Report will guide the Water Board in adopting the final remedy to be implemented at Hinkley. In its Feasibility Study submittals, PG&E has recommended that the final remedy consist of two distinct approaches, based on plume geography. In the northern half of the plume, where chromium concentrations are within the California drinking water standard, and where outside hydraulic influences create the most potential for plume boundary expansion, PG&E proposes to substantially increase the rate of groundwater extraction and agricultural treatment. This treatment technology is particularly well suited for this application, in that it allows extraction at rates and locations to optimize control and reduction of the plume boundaries while providing a sustainable and environmentally beneficial way of treating the extracted water to reduce chromium. For the more concentrated southern half of the plume, PG&E proposes continuation and expansion of our existing full-scale in-situ (in place) treatment systems, where the injection of food grade materials into the groundwater create chemical conditions that remove hexavalent chromium from the groundwater, converting it to a naturally occurring form of the metal. PG&E has already greatly expanded its rate of groundwater extraction and agricultural treatment in the northern half of the plume, above the rate that had existed in previous years. This expansion, together with other ongoing measures such as injecting a barrier of fresh water outside the plume, has significantly enhanced our ability to control and reduce plume boundaries. In addition, initial extension of our in-situ treatment systems has taken place, expanding our ability to create zones where chromium in groundwater is treated and removed. Meanwhile, PG&E has greatly stepped up its community outreach efforts at Hinkley, in recognition of the high level of interest generated by this project. We have increased the coverage of our programs to sample domestic water wells and provide bottled drinking water to residents located outside of the plume who may still have concerns about drinking water in this area. We have established an outreach office within the community and we have begun holding open house meetings to listen to community members and answer their questions regarding our programs. In addition, we have established a Community Advisory Committee, composed of local residents, that meets publicly each month, to advise, share concerns with and provide direct input to PG&E on its environmental and community programs at Hinkley. PG&E also continues to apply sustainability principles at a growing number of our remediation projects, building on a pilot program developed with the DTSC in 2009. We have worked with the DTSC to develop standard guidance for identifying, implementing and measuring site-specific best management practices, which we expect to finalize in 2011 and apply across our environmental remediation program. Examples of these best management practices include employing equipment that uses cleaner fuels, limiting the idling time of vehicles and the use of heavy load vehicles and adopting strategies to reduce the total volume of wastes created during the investigation and cleanup stages. They also include using local labor and proactively engaging with the local community, including supporting local businesses. In 2010, PG&E applied these types of sustainable practices at more than 40 projects. For example, at the former PG&E MGP site in San Luis Obispo, we took a number of steps from our initial project planning and community outreach efforts to actual construction activities in the spring of 2010. As a result, we achieved measureable results that will inform our approach at other remediation projects.